The FAA has issued a Airworthiness Directive on Ameri-King ELT's. Here is a link. My mechanic told me that the extremely long shelf life for the battery is one of the reasons for this. 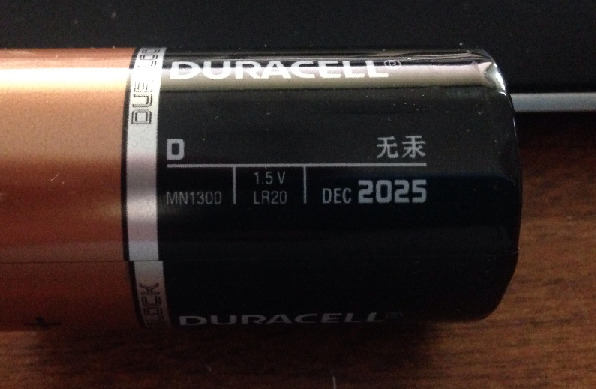 I believe my Energizer "D" cell batteries had a 2020 date when new in 2010. Many owners see no reason to check the ELT until the batteries expire. Batteries might leak before their expiration date. 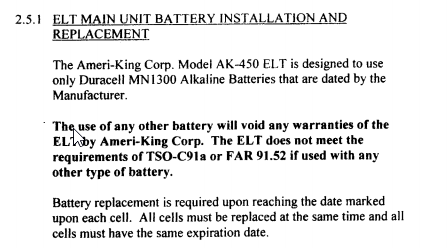 My mechanic recommends checking the ELT for leaking batteries each year and replacing the "D" cells in my Ameri-King at 1/2 their expire date. One reason to check the batteries annually, is because it is required by regulation. Batteries can leak and I usually just replace the "D" batteries at 3 years. They're inexpensive. Buy a "D" cell flashlight and use the discarded batteries in it. You have to use batteries printed with an expiration date on them. You can't use just any D cells. It's a requirement to comply with the ELT regulations. Without the date, you technically can't prove compliance. Read up on the history of the company. I've had these ELTs fail regardless of battery life. It specifically says Duracell MN1300. Those are the ones with the dates on them. You cannot use just any generics. The FAA nails people on this. Without the date or other manufacturer instruction for the life limit, you cannot comply with this 91.207: "The new expiration date for replacing (or recharging) the battery must be legibly marked on the outside of the transmitter and entered in the aircraft maintenance record. Paragraph (c)(2) of this section does not apply to batteries (such as water-activated batteries) that are essentially unaffected during probable storage intervals." You have no date to write, and these batteries ARE affected by storage. Here's an MN1300 that I have. Notice it has a date.